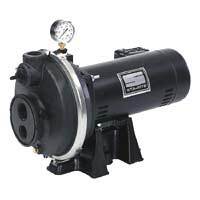 Superior Rustproof Construction Pump body is DuraGlas fiberglass reinforced thermoplastic lightweight, rustproof and exceptionally strong. All components in contact with water are resistant to the corrosive and abrasive forces found in the most aggressive water conditions. Heavyduty Motor Dustproof canopy completely encloses electrical components and provides dust, dirt and insect protection. Ventilating air cannot contaminate vital switching components. Permanently lubricated, heavyduty ball bearings ensure smooth, quiet operation and extended motor life. Precision Diffuser Multiport, reinforced polypropylene design primes faster and handles more air. Precision Molded Impeller Precision molded Noryl gives perfect balance and ultrasmoothness for highest performance and efficiency.